The 56th were garrisoning Gibraltar in 1779 when Spain declared war on Great Britain. 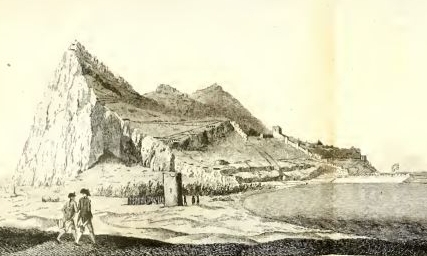 The Spanish army moved to attack Gibraltar but was repulsed and so began a long siege. The 560 men and 27 Officers plus the civilian population only received two relief convoys of food and so were on very limited rations. On several occasions raiding parties were sent out to damage artillery that the Spanish were assembling ready for an assault. The siege ended after 3 and a half years February 1783 when the war with Spain ended. This heroic resistance enabled the 56th and subsequently the Essex Regiment to the battle honour of Gibraltar and the incorporation of the Castle and Key into their insignia. John Cassan, Meridith Chambers, Henry Hamilton, Samuel Moore, John Pigot, Rice Price, Wyndham Quin and Charles Valletot. In 1786 John Drinkwater wrote a History of the late siege of Gibraltar in which he described the siege and named some officers and men from the 56th West Essex. John Drinkwater was a capatin the the 72nd Regiment who also served throughout the siege and was able to write from a first hand account.. In June 1799 Captain Lefanue joined the 56th by assuming a disguise and using a row boat to get into the port. In July 1799 Captain Vallotton was made a staff officer to the Governor, Major Hardy was appointed as Quarter Master General and Lt S Wood was appointed as Assistant Town Major. In August 1780 Ensign Bradshaw was taken as prisoner while entering harbour as a passenger on a sloop although he was later released. In September 1800 two men from the 56th deserted to the Spanish and these were followed by occasional deserters over the next few months until on 1st February 1781 the bodies of two deserters were found having died while trying to desert. On 15th April Surgeon Chesholme was wounded by a splinter from a door in the north casement when a shell landed. The surgeon broke his leg and badly wounded his knew an officer from the 72nd Regiment lost his leg in the same explosion. On 26th September 1781 , Lieutenant Clarke died of 'decline' no doubt hastened by the poor living conditioned under siege. In October 1781 Lieutenant Vicars was slightly wounded in the front lines during an exchange of fire. In November 1781 it was the turn of Lieutenant Edgar to be wounded this time by splinter from stones. On 16th March Lieutenant White was slightly wounded. In September 1782 two rank and file men were killed and another two wounded during exchanges of fire. 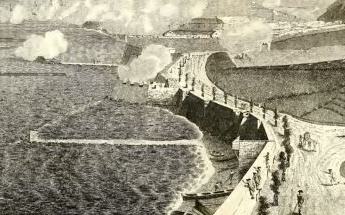 By the end of the siege the 56th West Essex had 17 rank and file killed, 1 Sergeant and 9 rank and file died from wounds, 1 officer and 6 rank and file disabled by wounds, 3 officers, 2 sergeants and 59 rank and file wounded but recovered and 1 officer ,4 sergeants and 34 men died by sickness and there were 3 deserters.